Although there are many ‘cháo lòng’ eateries in Vietnam, here we are going to show you the most delicious and famous pig congee places throughout the country. In fact, each region of the country has a different way of making and tasting ‘cháo lòng’, so remember to do your research before coming to a certain area. The local Hanoian with the love for cháo lòng usually comes to Hàng Tre. The restaurant is situated at the main street so it is very easy to find. This restaurant usually serves cháo lòng from the early morning to noon. Although this is just a simple and affordable restaurant, many people love to come here. The hot bowl of congee with the refreshing smell of vegetables and peppers. Like many other congee restaurants, the congee is cooked traditionally in Northern style, the colour of the congee is a little cloudy, served with pig’s offal and thin slices of liver. When tasting, people often sprinkle the congee with pepper and fresh herb or add a little bit of fish sauce for additional savour. Just a noble restaurant, small space of serving, simple furniture but this cháo lòng place is always full of customers because of the specially made pig’s offal congee. A bowl of congee served at this place is always full of delicious pig’s guts with thin pure congee. The bowl of congee is served with its full beauty. All the ingredients is kept clean, the chef only chopped and cut and slightly cooked through the thin congee which has been boiled in the kitchen. Therefore, customers have to wait a little longer than usual, but you will find every single second you waited is worthy because the guts is very brittle, fragrant and without any stink. 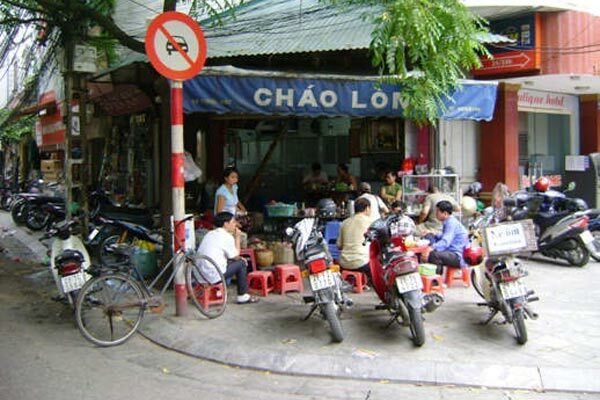 If you are looking for delicious but cheap food in Hanoi, you could never miss the cháo lòng place at the front of Đào Duy Từ alley. This is just a very small eating place with 4-5 plastic tables, even customers sometimes have to sit together with strangers, but is always crowded with people coming in and out for their amazing congee. The congee here is served in full, filled with hearts, stomach, colon, liver and only little congee. They also add some daisy vegetables and spring onion on top of the congee. 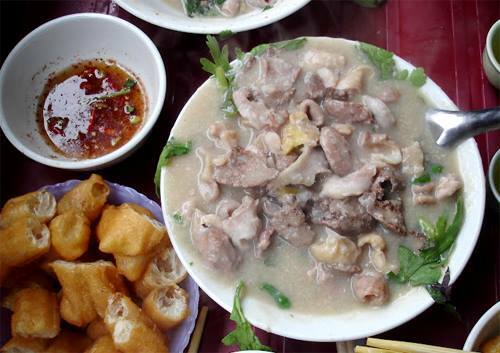 It’s a very interesting experience to enjoy pig’s offal congee in the cool air of Hanoi. The incredible flavor of congee here can easily please any critical customer. One of the delicious eating places in Hanoi is the restaurant at the front of Hàng Phèn Street, with the age of 20 years. None of a connoisseur in food is unfamiliar with this restaurant. This is only a street eating place with several plastic tables and chairs but customers keep coming all the time. 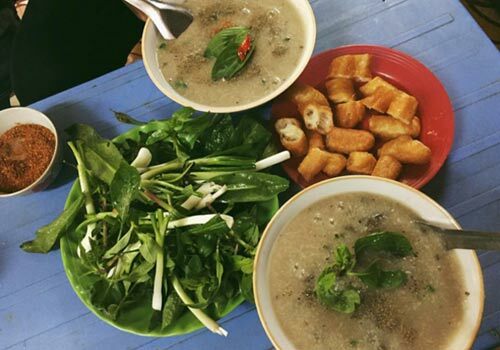 In the cool atmosphere of autumn, sitting silently with a spoon of congee, enjoying the extraordinary taste, the solidarity, the sweet smell of congee and herbs is one of a unmissable experience in Hanoi. This is my personal favourite ‘cháo lòng‘ eatery in Ho Chi Minh City. 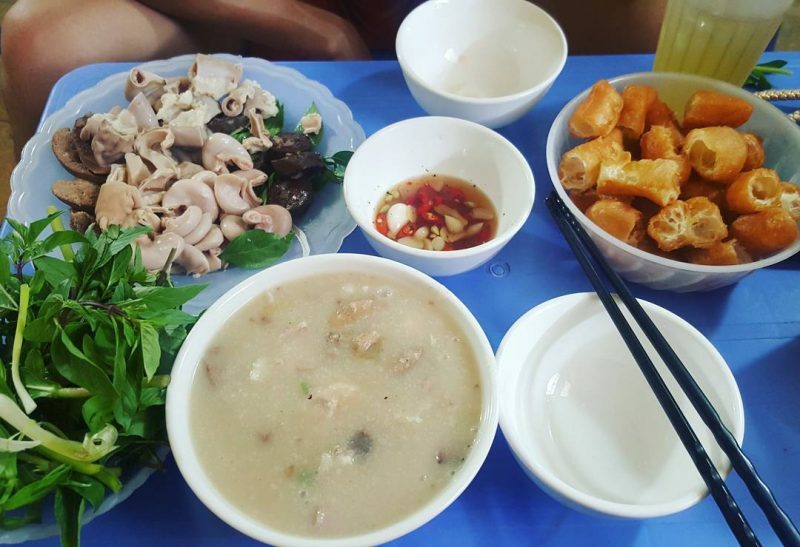 This restaurant is located in a small alley on Nguyễn Thị Minh Khai Street, an alley so small in the center of Saigon that even a car could not come in. Although this place is not easy to find at all, but everyday, from about 2pm to late night, this alley is always crowded with people, from normal students to elegant customers, all cháo lòng lovers, coming to enjoy their delicious bowl of pig’s offal congee. Beside pig’s offal congee, this place also serve many other familiar dishes bearing the bold taste of Saigon such as salad rolls, dried beefs, papaya salad,etc. Also, the special feature that makes this place one of the most famous cháo lòng restaurant is its harmonious combination between the taste of Northern and Southern congee. This place, situated at the West Gate of Bến Thành Market, is only a carrying pole but is always crowded. The congee here is very nice, soft, delicious and rich. Address: 49 Phan Chu Trinh, Bến Thành Province, District 1, Hồ Chí Minh City. The congee here is very delicious, nice seasoning, the pig’s offal is fresh, and herbs are cleaned. Very devoted service. Another way of finding the best cháo lòng restaurant for you is to ask any local you see, if you can. They always know best. If you ever come to Vietnam, do not forget to try out this extraordinary congee, if you have the guts. If you have any problem travelling in Vietnam, whether it’s food problem or anything else, please don’t hesitate to contact us for more assistance. We would be thrilled to help.